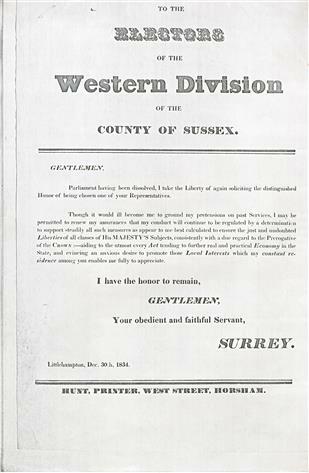 To The Electors of the Western Division of the County of Sussex. Parliament having been dissolved, I take the Liberty of again soliciting the distinguished Honor of being chosen one of your representatives. Though it would ill become me to ground my pretensions on past Services, I may be permitted to renew my assurances that my conduct will continue to be regulated by a determination to support steadily all such measures as appear to be best calculated to ensure the just and undoubted Liberties of all classes of His MAJESTY’S Subjects, consistently with a due regard to the Prerogative of the Crown;-aiding to the utmost every Act tending to further real and practical Economy in the State, and evincing an anxious desire to promote those Local Interests which my constant residence among you enables me fully to appreciate. Your obedient and faithful Servant, Surrey. Hunt, Printer, West Street, Horsham.